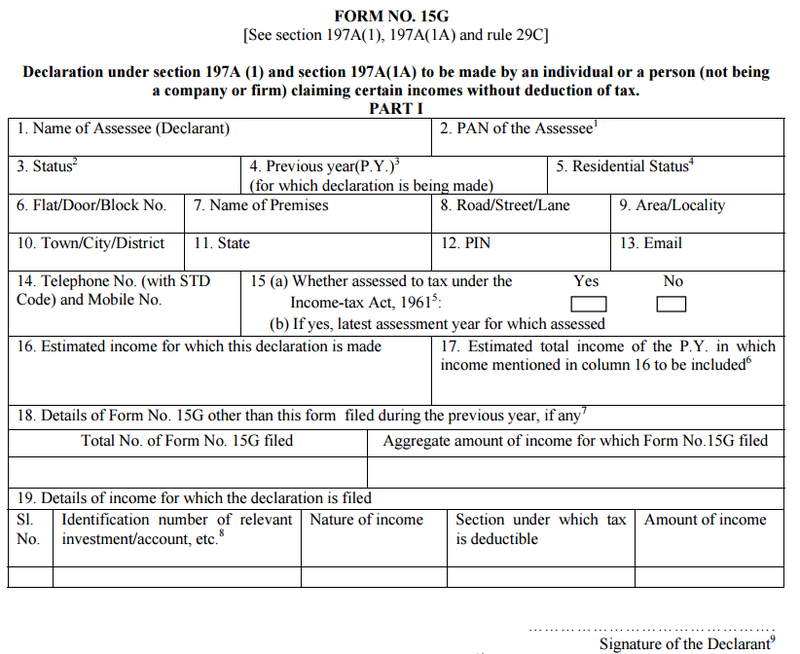 1, Under form 15G, AY year tax is nil, but not filed. Can we still mention the same declaration year in column 16? If you can clarify under example the table you have added why it has 1.5Lakh deducted in every scenario ? TDS on FDs are for everyone irrespective of being farmer of not. Hi I am NRI for more than 25 Years and I have NRI IRs deposits in India. If I returned to India, how long will my Deposits remain NRI? I mean without IT deducted. It can be 2 to 3 years depending on your month of return in India and number of days you have stayed in previous years. Amit, many thanks for the clear explanation. My mother (60+) has auto sweep facility in her SBI savings account and I am trying to submit her 15H form. She has no other income source. Auto sweep creates deposit accounts with F.D. rates, whenever the balance in savings goes above a threshold. I am confused about how to calculate the income in this P.Y. Suppose, a sweep of Rs. 1 lakh (new deposit account opens) was made on October 1, 2016 and it will mature on October 1, 2017. With 7.25% interest rate, the deposit account shows a maturity amount of Rs. 107250. Then, how should I calculate the income amount in this financial year (April 1, 2017 – 31 March, 2018) or P.Y. for this deposit account. Should the income be Rs. 7250, or should it be a certain fraction? Also, should the income tax section be 194A? The interest income has to be calculated for the present financial year only. As in your case for deposit made from October, the interest for financial year would be for Oct to Mar only (6 months). So your income for FY would be slightly less than half of 7250. You can do a rough calculation yourself and if not then you’ll need to ask your bank for the breakup. I have interest from bank on Fixed deposits from 2 banks. I am yet to file 15G for both the banks. While filing 15G for 1 bank, do i need to write 1 in Total no of forms filed (Field 16) for other bank? 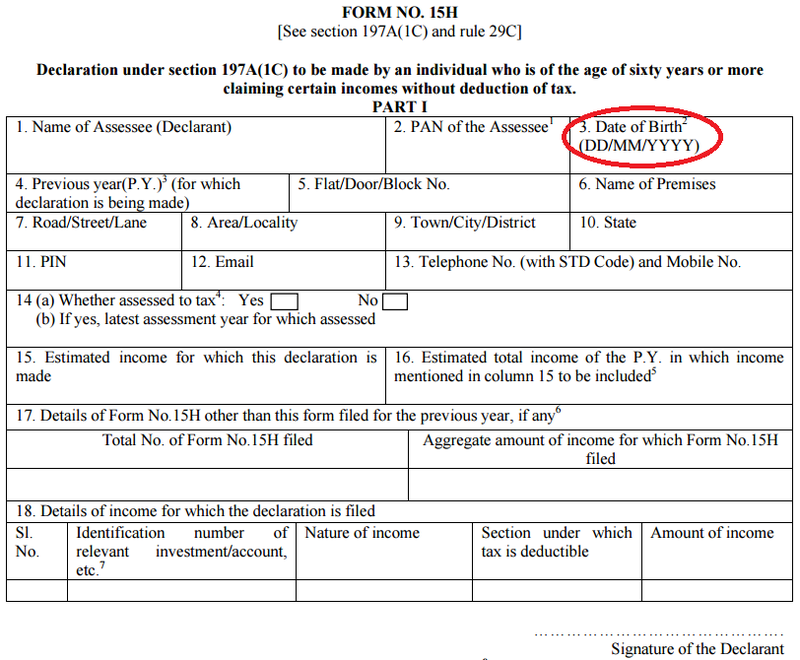 Also do i need to write amount of interest of the form of that second bank which i am going to file in field “Aggregate of income for which Form 15 was filed? You need to sequence the forms. For first bank you need to write 1 and for second 2 and so on. And yes for “Aggregate amount of income for which Form No. 15G filed” keeps on increasing in similar manner. I am out of job since 01 year. i joined with a company 02.01.2014 and resigned 29.01.2017… my salary was 15000/- so what willbe at col-4,16,17, and at col 19 what is identification num/ and amount of income? I agree the space given for such a question is not sufficient and unfortunately you find such issues in almost all government issued forms. You can list you high value FDs in the space given. The other option would be to consolidate your FDs at bank level. I am not sure if there is any provision of extra sheet attachment with the form. But you can confirm with the bank in question. All I can think is this column is meant to capture annual income from all other instruments and has no significant meaning. This is more of a legacy field as the government forms have habit of asking things which have no real significance. As of today all the interest paid is reflected on FORM 26AS. So this column is ideally not required. I can suggest just list down your high value FDs, no one would after you if you have calculated and paid your taxes honestly! 1) My fathar is 75 up and getting pension around 2,80000/- Per year as well as other income of interest around 100000 per year, Should he submit form 15H? 2) His Bank’s officer says to fill all FD’s details of other banks in 15 H form…is that necessary? He can submit Form 15H if his tax calculated after taking all the deductions and exemptions is NIL for the financial year. So on income of Rs 3.8 lakhs if he makes investment of Rs 80,000 in tax saving instruments his income tax would be NIL and hence eligible for form 15H. However for 15G (for people below 60 years of age) the tax deduction is not considered to calculate eligibility. Amit, what if his father invest Rs 80000/- in PPF in same financial year. His income will come into non taxable bracket. Do his father need to submit 15H knowing his PPF account is in same bank where his FD’s are there and pension get deposited. Have changed my comment. The rules are different for Form 15G & H. So if he makes any 80C investment for 80K he can fill Form 15H. It does not matter if the PPF account is in the same bank. The Form 15G/H are self-declarations and so does not require any proof! I would like to withdraw my pf amt and want to know what to fill in col 16. My only expected amt is my pf. But, what will be the amt to declare. My epf bal is updated only till 31. 03. 2015. So can i just mention that amt or should i estimate the amt. will we be able to know what the exact pf bal amt. You can write the best case estimate. You need not mention the exact figures – approximation would work here! It is required form 15-g for withdraw PF Amount . And also what is the amount that I have to fill in column 16 ,17 & 19 of form 15G in my case.